none of which that could not be. 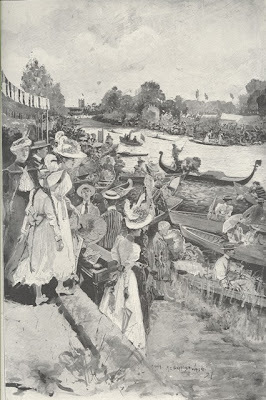 Artist Henry Charles Seppings Wright gave this view from the Grosvenor Club Enclosure (later to be The Remenham Club) of the final of the 1897 Diamond Challenge Sculls between Harry Blackstaffe (on the Bucks side) and Ned Hanlan Ten Eyck (on the Berks side) in The Illustrated London News, 24 July, 1897. St Mary’s Church is a well-recognised land mark in the background. Like many other images on rowing and boat racing, this is featuring the spectators and the liveliness on the riverbank, while the race is a secondary event in the background. 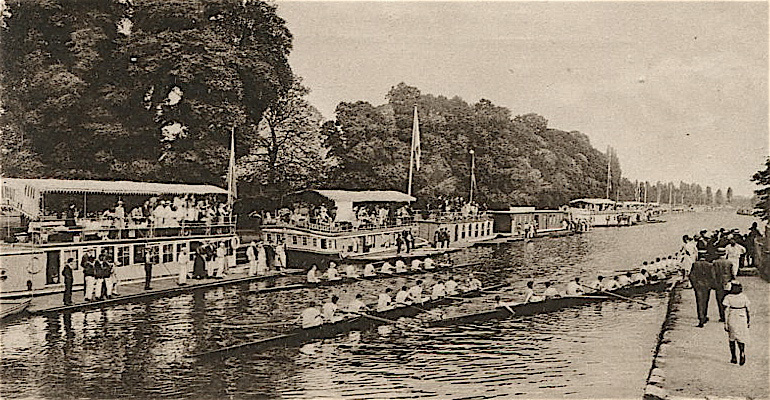 Three American scullers competed for the 1897 Diamond Challenge Sculls at Henley Royal Regatta. In his first heat, W.S. McDowell of Delaware BC easily defeated the Hon. Rupert Guinness, who sculled for Thames RC that year. The previous two years Guinness had won the Diamonds, but then in the colours of Leander. 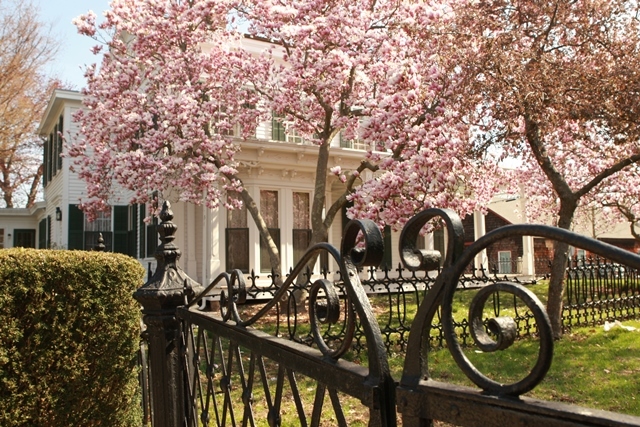 The second American was Hunting Howell, who could not really be counted as an American, despite that he was from New York. Howell sculled for Trinity Hall, Cambridge, and it was first when he was admitted to ‘the Hall’ in 1894 that he had taken up the oar. Howell had a lucky draw and had his first heat in the ‘quarterfinal’ where he met G. McHenry of Thames RC. McHenry had sculled in the Diamonds before, in 1892 for a Paris club, and in 1893 in the colours of Thames RC. Hunting did not have any problems winning his first race in the Diamonds. 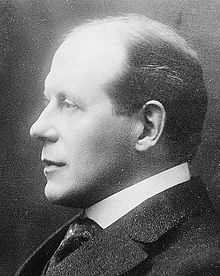 In his next heat, he was to race against his countryman from Massachusetts, Edward ‘Ned’ Hanlan Ten Eyck, named after the Canadian world professional sculling champion, who was his god father. Ten Eyck of Wachusett BC, who was four years Hunting’s junior, had been allowed to enter the Diamonds despite the Henley Stewards suspicion that he was a professional. 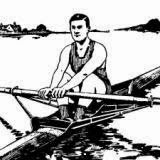 This assumption was mainly based on his coach, his father James Ten Eyck, who was a well-known professional oarsman. 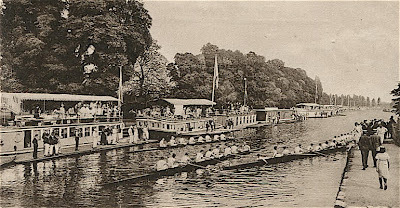 At this time, there was a growing irritation among certain men in the English rowing establishment about having American oarsmen to compete at Henley. 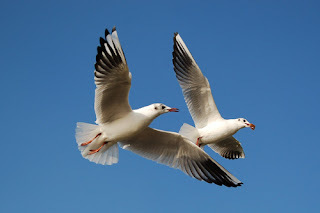 There was no way for the Henley Stewards to do a ‘background check’ if the American oarsmen racing at Henley were real amateurs, or if they were semi-professionals, or even full-time professionals. Nevertheless, this did not affect or relate to Howell. In his case it was different, as he was sculling in the black and white colours of a well-respected Cambridge college. He was thereby molded in the proper English way. The American Trinity Hall man rowed a great race, but at the end, Ten Eyck beat him, but only by a quarter of a length. In the final, in a new record time, 8 minutes 35 seconds, Ten Eyck easily defeated Harry Blackstaffe of Vesta RC who sculled in his first final of the Diamonds. Even Blackstaffe, whose friends called him ‘Blackie’, had in the beginning of his rowing career had difficulty being regarded as an amateur as he was working in the meat trade. Before the winning ceremony, some of Blackie’s friends urged him to protest the result as Ten Eyck was, in their eyes, a professional. Blackie refused as he saw a protest as an unsportsmanlike gesture. 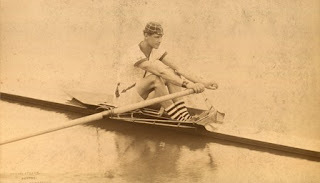 In the 1898 issue of the Rowing Almanack and Oarsman’s Companion, its editor Edwin D. Brickwood, signature ‘Argonaut’ (Diamonds winner in 1859 and 1862), reflected on the passed rowing season, when he wrote about Ned Ten Eyck: ‘the very strong presumption from his parentage, his associations, and his appearance, that he was by no means of the British type of amateur, still less a gentleman amateur.’ In his article Brickwood mentioned all the professionals who were present at Ten Eyck’s celebration banquet at the Half Moon: the boat builders John H. Clasper, George Sims and W. Winship, and the famous oarsmen Tom Sullivan, Bill Barry, Charles ‘Wag’ Harding, Bill East and twenty others. Brickwood sourly rounded it up with a Latin phrase: Noscilu e sociis – ‘It is known from its associates’. 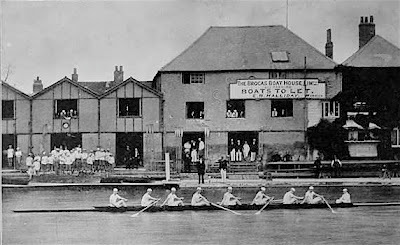 For the 1898 Henley Royal Regatta, the Stewards turned down Ten Eyck’s application to defend his title in the Diamonds. I have to say that this year’s field is a tough one, because how are you going to be able to pick out only one of these incredible athletes? It seems to be an impossible task… The list does raise a question, though: Is not the Thomas Keller Medal for those rowers who have retired from active competing? Or has this rule being changed? I cannot remember reading about such a change; and if it has not altered, have Grainer and Ebbesen retired from top elite rowing? The winner of the Thomas Keller Medal will receive an 18-carat gold medal. 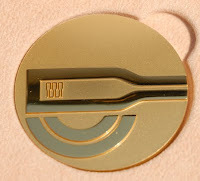 This year’s medal will be presented at the Nation’s Dinner of the 2013 Samsung World Rowing Cup in Lucerne, Switzerland. It will be bestowed by Dominik Keller, the son of FISA’s former president Thomas Keller, and Denis Oswald, president of FISA. Had a problem doing his piece. "Don't lose your head at the release." When my Henley badges hit the mat. I worry it'll land upon the cat. In five - six - four syllable time. In just getting it to rhyme. Heavily hanging on tree branches. To take them out on the blue fields. That multiply like Odin’s Draupnir. 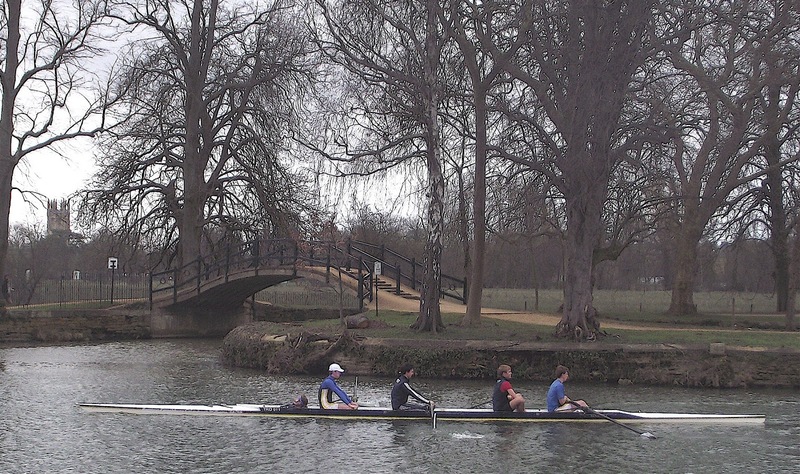 A coxed four on the Isis with Christ Church Meadow in the background. Christ Church (one of the forty-four colleges or halls that together comprise the University of Oxford) was founded in 1524 and alumni include Sir Christopher Wren, John Locke, John Wesley, William Penn, W. H. Auden and Lewis Carrol. Of these, only Carrol rowed (though Penn did found one of the great rowing States). Just over a year ago I visited the Cambridge Lent Bumps where I was particularly struck by two things. 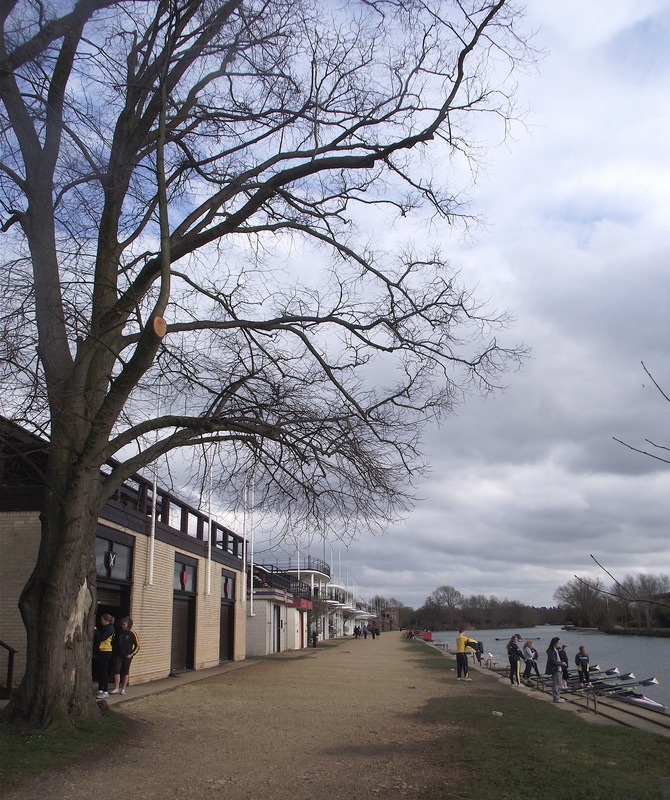 One was the madness that is ‘bump’ racing and the other was the sight of the beautiful Victorian boathouses that belong to many of the Cambridge colleges. 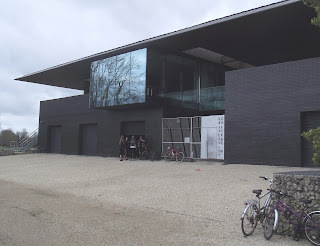 A report on the latter is a HTBS story that has yet to be written as I did not have time to cover the bumps and to investigate the many attractive buildings that line the River Cam along Midsummer Common. 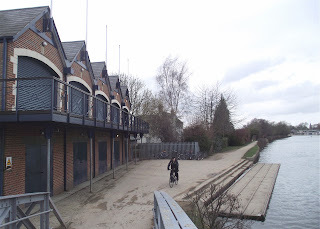 However, on a recent trip to Oxford I decided to investigate the Dark Blue’s equivalent, the college boathouses by Christ Church Meadow along the Isis (as the Thames at Oxford is called). My investigations started well. 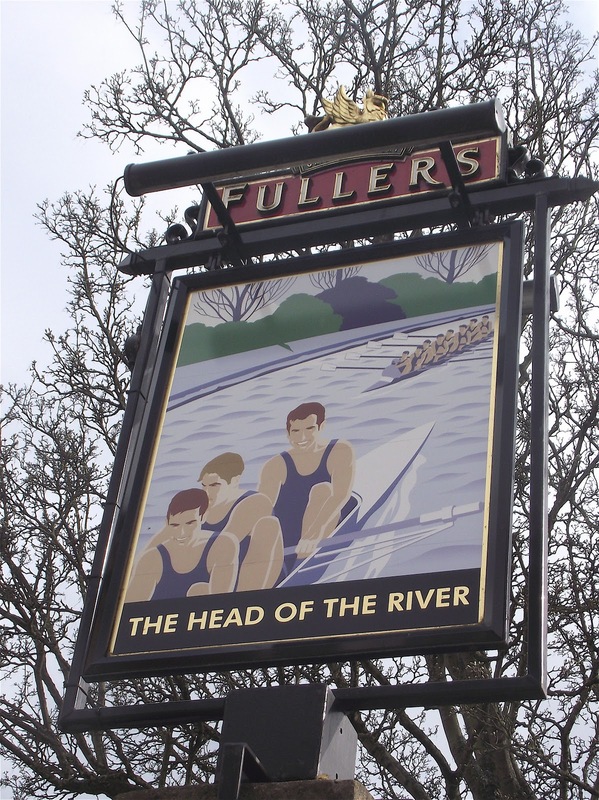 On approaching Folly Bridge, the western end of the approximately 2,000 metres of river between the bridge and Iffley Lock used by the boat clubs, I came across the appropriately named ‘Head of the River’ pub. 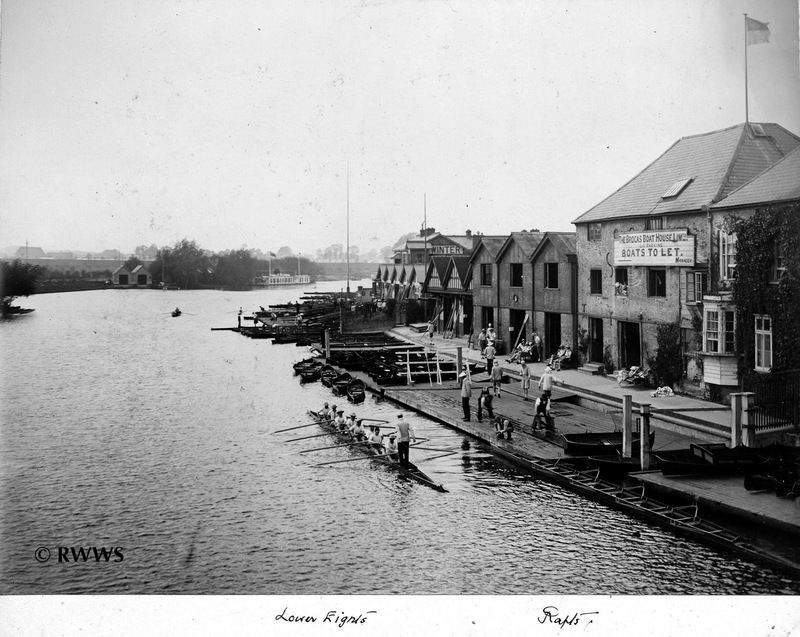 This panoramic picture shows the Head of the River pub on the left and the boathouses in the distance on the right. 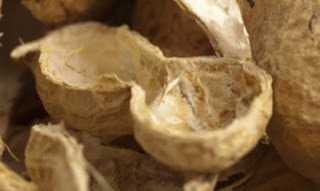 Like all pictures on HTBS, it can be enlarged by double clicking on it. 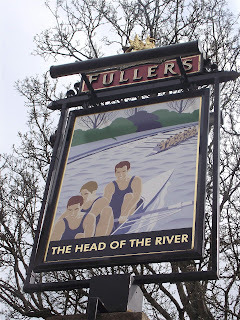 The ‘Head of the River’ sign. Appropriately the pub is owned by Fuller, Smith and Turner whose 350 year old brewery is based near the mid-way point of the Boat Race on the Thames at Chiswick, West London. They are great supporters of rowing on the Thames Tideway and they sponsor the Head of the River Fours and Hammersmith Amateur Regatta. Most college boathouses are on the north bank of the river and, approaching from Folly Bridge, the first of these that I encountered was the shared home of Wadham, St Anne’s and St Hugh’s. It was built in 1990 and is most generously described as ‘architecturally inoffensive’ though ‘bland’ also comes to mind. Oxford’s ‘Boathouse Row’ looking east from the Folly Bridge end. Wadham et al have the boathouse nearest the camera. The next club houses are a semi-detached pair from 1968 belonging to Pembroke and St Edmund Hall. Both are utilitarian buildings, they are simply boxes with a roof terrace. Pembroke may have a boring boathouse but at least they seem to be making full use of it. The next two buildings are a pair, more attractive than their neighbours, slightly ‘art deco’ in style, their curving lines reminiscent of a 1930s liner. In fact they were built in 1964, one for Corpus Christi and St John’s and one for Jesus and Keble. Jesus College and Keble College Boat Clubs. Three more ‘boring boxes’ from the 1950s or 1960s follow, ironically housing some of Oxford’s oldest boat clubs. The trio are the bases for Brasenose and Exeter, then Lincon, Queen’s and Oriel, then Balliol and New College (typically of things at Oxford, ‘New College’ was founded in 1379). The last three boathouses on the north bank are the oldest, dating from the late 1930s or 1940s. Their design is uninspiring though their red brick construction gives them some interest. The one on the left belongs to Merton and Worcester. The middle one houses Magdalen (usually pronounced "Maudlin"), Lady Margaret Hall, Trinity, and St Antony’s. The one on the right is occupied by Christ Church and is, appropriately perhaps, reminiscent of the chapel of an austere Protestant sect. The south bank of the river has only two college boathouses but between them they house twelve boat clubs and include the most controversial building on the Isis. In 2007, University College opened an ultra modern £2.7m / $4.1m structure which subsequently won a Royal Institute of British Architects prize. University College Boathouse. At least it’s not boring. University College also shares with Linacre, Somerville, Wolfson, St Benet’s and St Peter’s. 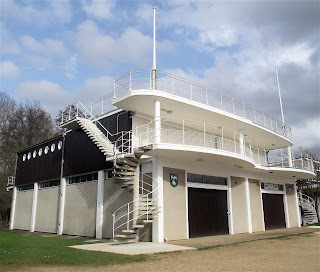 This most modern of buildings is on the site of a very traditional one, the former Oxford University Boat Club boathouse. 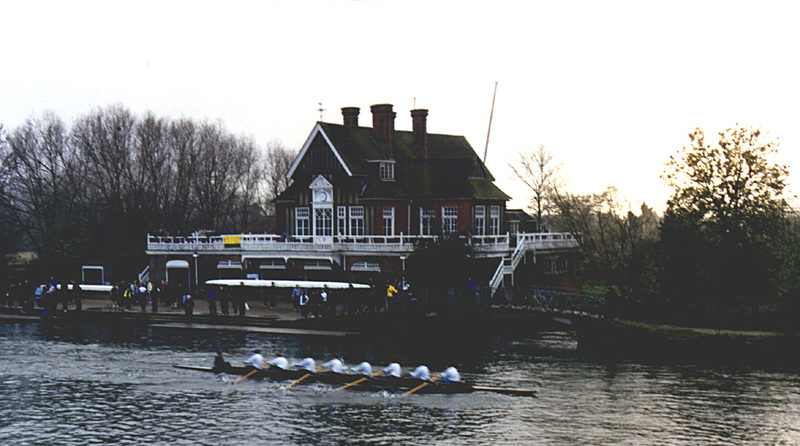 The old building was an ornate, typically Victorian riverside construction which was erected in 1881 by University College who then leased it to OUBC. Sadly, it burnt to the ground in 1999 taking much of the University Boat Club archive with it. 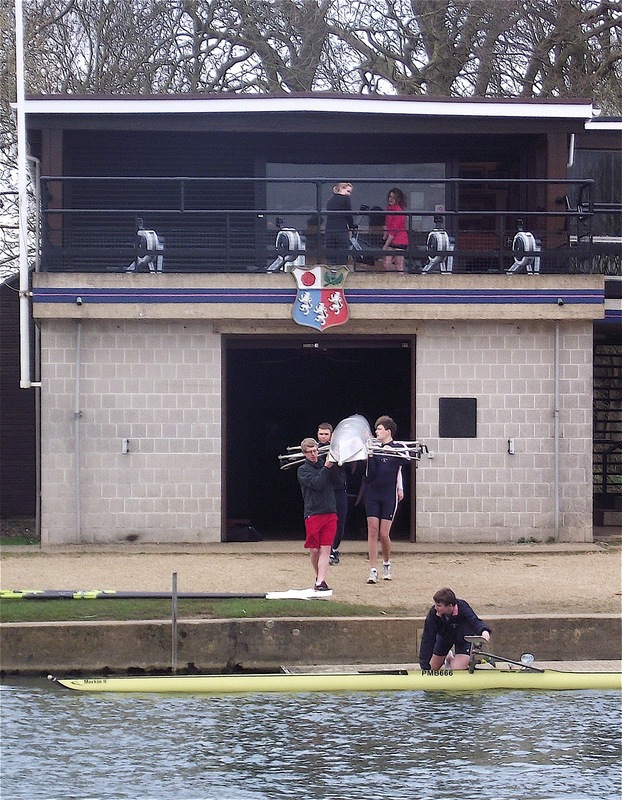 OUBC did not take a lease on the replacement building as its crews now train on better water in Wallingford where a state of the art boathouse was opened in 2006. The other boathouse on the south bank is in a safer, more conservative and traditional style even though it was only built in 1996. Long Bridges Boathouse belongs to Hertford but also houses Mansfield, St Catherine’s, St Hilda’s and Templeton. By the time I had got to Long Bridges I began to wonder why the Cam is lined with many beautiful Victorian boathouses while the Isis boat clubs have relatively modern and largely unattractive functional buildings? 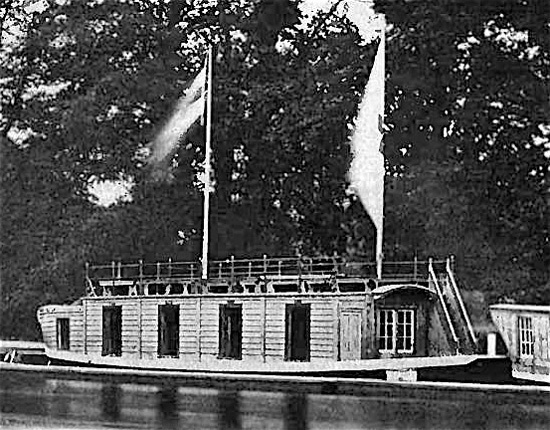 A coach that I fell into conversation with told me that the answer lies in the fact that originally Oxford college boat clubs based themselves not on land but on large ornate barges that were moored along the river in front of where the boathouse now stand. These were employed as locker rooms and to host social functions and for spectators to use as a viewing platform during bump racing and regattas. College Barges along Christ Church Meadow in Eights Week, 1926. Like the one above, most pictures featuring college barges seem to have been taken during ‘Eights Week’ such as the splendid photographs here and here. Strangely, the Flickr photostream of the Swedish Heritage Board has a couple of nice images, one of the Pembroke Barge and one of the St John's Barge. 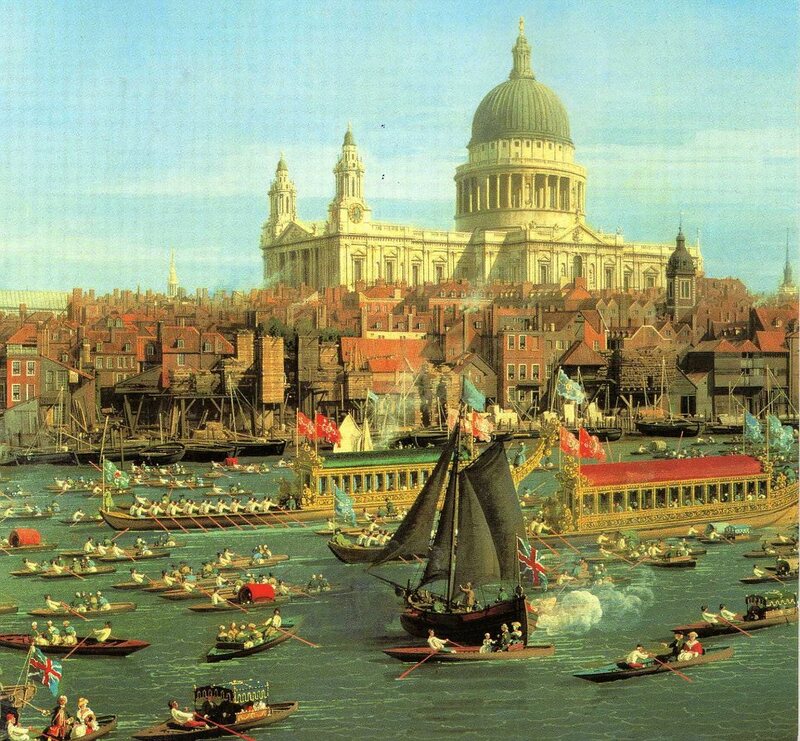 As this picture shows, transport to the barges from the opposite bank cared little for health and safety. 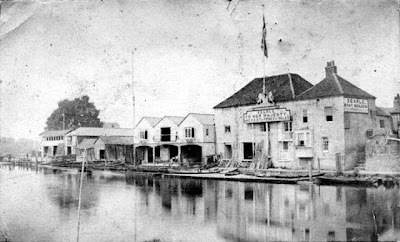 The first barges found their way to the Isis in the 1840s and were originally highly ornate craft built to be rowed by eighteen or more men with much ceremony in grand river processions by the ancient City of London trade guilds known as Livery Companies. By the mid-nineteenth century these processions were, after several hundred years, going out of fashion. Luckily this coincided with the rise of amateur rowing at Oxford and so the barges were sold off to become the static headquarters for the emerging boat clubs. They were adapted slightly to their new role but the spirit and grand appeal of the original ceremonial craft was maintained. This barge belonged to Jesus College between 1911 and 1964. 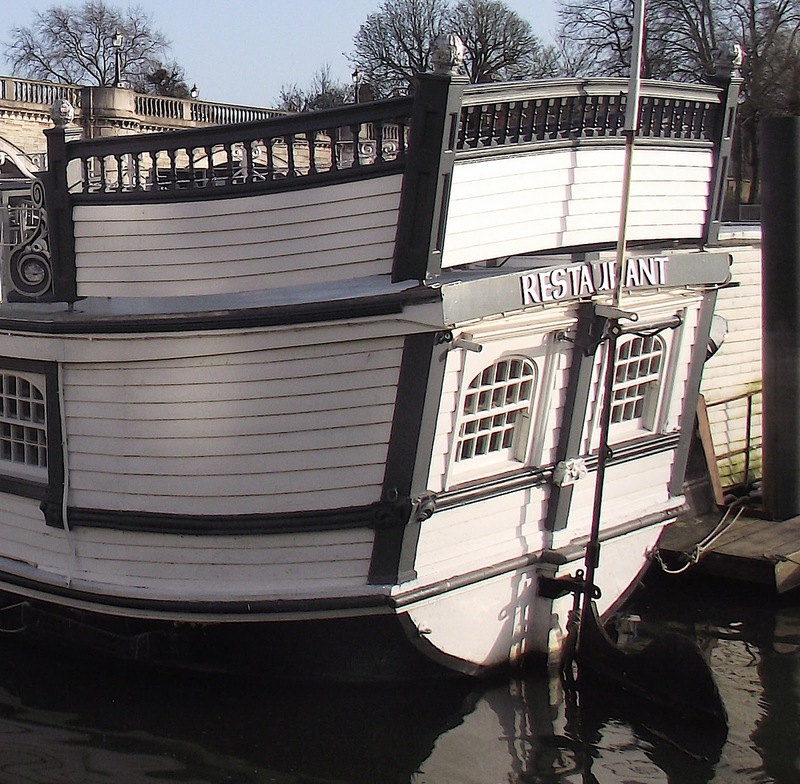 It is now moored at Richmond, West London and functions as a restaurant. The stern of the Jesus barge. Some detail on the Jesus barge. It was formerly painted in the college colours of green and white. For those who wish to know more about these craft, there is a book (which I have not read), called The Oxford College Barges: Their History, Architecture and Use by Clare Sherriff. It is published by Unicorn Press. The boat club barges which bring an Edwardian grandeur to Eights Week in Oxford are one by one yielding their stations along the Isis.... To-day there are thirteen of them.... in little more than a year the number may be six or seven...... Rowing opinion in recent years has hardened against them...... Oxford rowing men are sternly bent on ending the long ascendency of Cambridge; and they feel that an important requirement is properly equipped boathouses. I hope the barges will all be gone in ten years. I don’t mean this from the aesthetic point of view, but from the point of view of rowing. Boathouses are more efficient. The disappearance of barges is a sign of the fact that there is no longer a leisured class at Oxford. Jesus, New, St John’s and Pembroke shared this barge for many years after 1857. The four doors each access the four individual changing rooms – which must have been very small and dark. 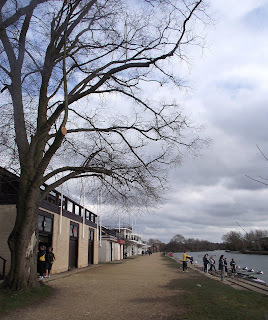 Cambridge with its boathouses makes rowing reasonably comfortable for all crews. 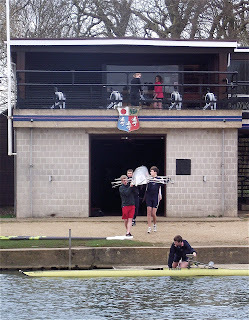 The College Barge at Oxford makes rowing moderately comfortable for one crew, barbaric for the rest. The College Barge was still very much in use as a base for outings, and in 1964/5 we actually lived in it for some time to save money while doing long terms of research. We cooked on a gas stove and invented the Bucket and Blade Club for those who shared this probably illegal residence, and its basic bucket sanitation. John Haden, Captain of Boats 1965-1966. By 1966, ten years after the 1956 Times article, only Hertford, Pembroke, Wadham and St Catherine’s retained their barges. Hertford’s went in that year, Pembroke’s two years later, Wadham’s in 1973 and in 1978 Catz was the last college to give up their relic of Victorian boating. Tim aboard the barge formerly belonging to Jesus College. Now where’s that bucket...? Another question arises. 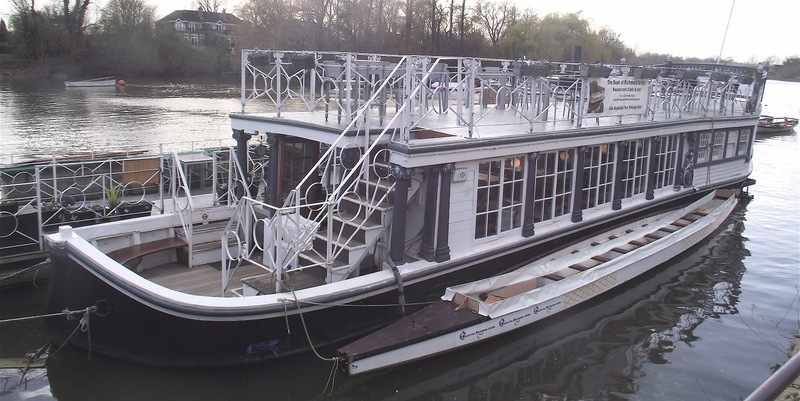 Why was the use of floating barges purely an Oxford phenomenon, why did Cambridge clubs base themselves on land from the start? Again, the answer is simple. The Cam is too narrow to comfortably moor barges and to allow reasonable space for rowing boats. Also, it was easy to get the former Livery Company boats along the Thames from London to Oxford. To move a barge from London to Cambridge would require a difficult journey via the sea. Thus, the Light Blues built along the Cam in a time of Victorian confidence and affluence while their Dark Blue counterparts erected most of their boathouses in the 1950s and 1960s, a time of considerably less wealth and certainty. The difference is clearly reflected in the quality of the respective buildings. However, things are slowly improving along the Isis notably with the new University College and Long Bridges boathouses. It looks as if things will only get better. As usual, the British Pathe cinema newsreel site provides wonderful moving pictures that serve as a memorial to this splendid (if not very practical) part of the history of rowing at Oxford. Watch it here. sun mixing shadow with fire. then drained all color to gray. Here is another one of those films that is not a rowing movie, but has a short rowing sequence – you blink at the wrong moment and you missed it… However, I find it a very entertaining movie. 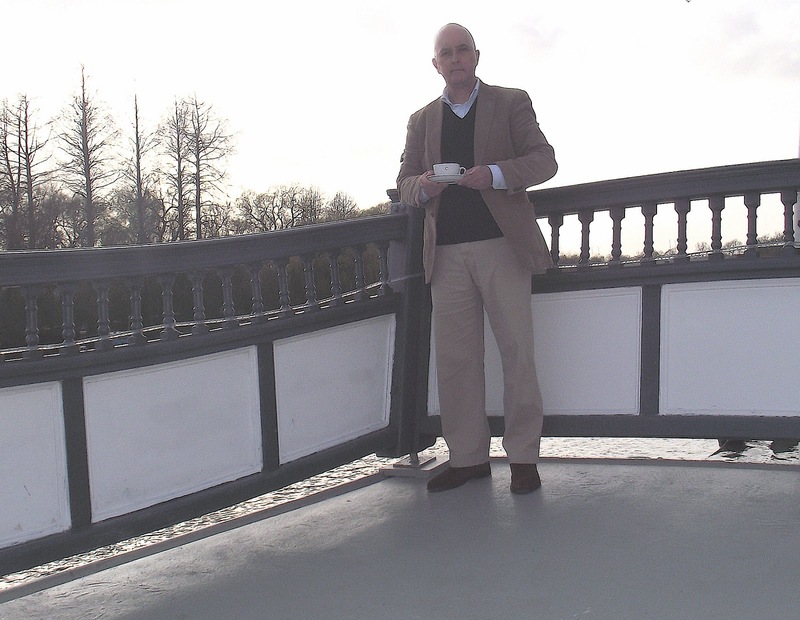 An Englishman Abroad (1983), with a script by the famous British playwright and author Alan Bennett, is based on a true story. In 1958, the British Shakespeare Memorial Theatre was performing Hamlet in Moscow. In the interval Coral Browne, who played Hamlet’s mother, Queen Gertrude, got an unexpected guest in her dressing room when an English gentleman barged in, quite drunk and threw up in her sink. He didn't give her his name, but it was soon revealed that he is Guy Burgess, one of the so called ‘Cambridge Five’, the ring of spies who were recruited at Cambridge in the 1930s by the Russians to spy on Great Britain (and the USA). 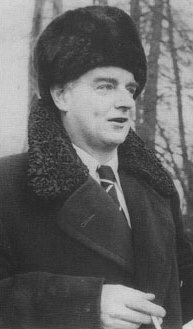 In 1951, Burgess defected to Moscow together with Donald Maclean. In 1963, 'the third man', Kim Philby, escaped from Beirut to Moscow. 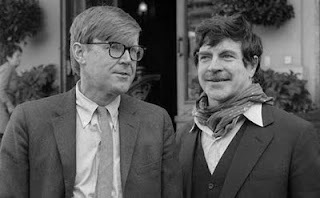 Alan Bennett and Alan Bates. Guy Burgess is played by Alan Bates and Coral Browne plays herself! The ‘rowing sequence’ is only 10 seconds long, at 50:10 – 50:20. 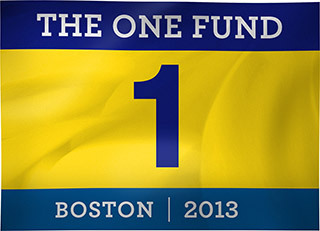 Massachusetts Governor Deval Patrick and Boston's Mayor Tom Menino says the city has established 'One Fund Boston'. "At times like this we are one state, one city and one people," Governor Patrick said. Boston based insurance company John Hancock has already committed $1 million to the fund, which will raise money for families most affected by the bombings. Photo: Canada's Sports Hall of Fame. Winning a gold medal at the Olympics is hard. The ability to remain calm and focused throughout one’s match or race can mean the difference. 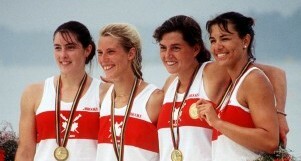 The 1992 Women’s Olympic Gold Medal Crew in the Coxless Four: Kirsten Barnes, Brenda Taylor, Jessica Monroe-Gonin, Kay Worthington and Jennifer Walinga did exactly that. A day before the competition, Walinga was forced to withdraw from the competition due to injury. The team remained focused, trusting that Kay Worthington would be able to continue the success and keep the chemistry of the crew. The substitution of Worthington into the crew was so seamless that it resulted in the crew winning Olympic gold. The crew understood that the Olympic gold medal they won that day was not just won on the day of the race, but through the training and competitions leading up to it. Since Walinga was not in the boat, she did not receive a medal from the International Olympic Committee. As such, Taylor created a replica of one of her two Olympic gold medals that she had won at the Olympic Games and donated it to Walinga; recognizing the fact that the crew could not have won the gold medal without her. The united determination of the five women bonded them as they handled their challenges. In the end, their determination, focus, trust and sacrifice would define them as one of Canada’s best rowing crews ever. The other day HTBS-colleague Greg Denieffe pointed me in the direction of an old Swedish rowing medal on eBay. It was handed out as a winning medal (‘1 Pris’) for coxed fours on 19 July, 1908, at a regatta held in Vaxholm, a small town in the outer parts of the Stockholm archipelago. The organiser was the local rowing club, Vaxholms Roddförening, and on the medal you can see an out-rigged coxed four and the town’s coat of arms (as it looked then) with the Vaxholm fortress, which was first built in 1510. It was some time after the 1650s that the fortification got its round stone tower which is still in the town's coat of arms today. The fortress was not only kept as a military protection (against the Russians), as the sea entrance to Stockholm, it was also a customs-house where duties were paid by outside merchants going in to the Swedish capital. Rowing had been practiced for centuries in the archipelago – it is also known that there were rowing races in the 1860s and 1870s – before the first organised rowing club saw the light of day in Vaxholm in 1883. Soon, other rowing clubs were founded in the area, but they all only lasted for a couple of years. However, in 1889, Vaxholms Roddförening was founded and rapidly grew to be one of Sweden’s most successful rowing clubs before the Second World War. It was the first Swedish rowing club to compete in Finland, where in 1902, the club raced and won against the local rowing club in Helsinki and some Russian clubs. Its members became Swedish champions, Nordic champions and represented Sweden in the Olympic Games in 1912, 1920 and 1936. I am sorry to say that I have not been able to locate any information about this 1908 regatta. The most famous regatta organised by Vaxholms Roddförening is Distanskapprodden (‘The Distance Race’) which is a 14,500-metre (9-mile) long race between Stockholm and Vaxholm in inrigger coxed fours. This race was first organised in 1894, but then by another rowing club, Hammarby IF. Between 1905 and 1907, and then from 1919, it has been organized by Vaxholms Roddförening. Take a look at some of the more recent racing photographs here. There was already a famous rowing race in 1844 between the Vaxholm fortress and the centre of Stockholm. That year, a Russian expedition, which was doing scientific measuring of the Baltic Sea, had received the permission by the Swedish king Karl XIV Johan to visit Stockholm. When the vessel, a paddle steamer, approached Vaxholm fortress it did not only neglect to stop to be inspected, it broke the code of honor by not saluting the Swedish flag which was raised on the fortress. This annoyed Colonel Anders Israel Panchen, the old commander of the fortress, who ordered a canon-shot to be fired in front of the Russian vessel. The Russians still ignored the order to stop whereupon Colonel Panchen ordered a second and then a third salvo towards the paddle steamer. The third shot hit the wheel and made the vessel unmanageable. A Russian Navy officer and his crew rowed over to the fortress to ask what was the matter? Colonel Panchen informed him that they had insulted the Swedish flag by not saluting it. The Russians rowed back to the paddle wheeler, but suddenly their boat changed its course to row into Stockholm to complain to the king. Panchen ordered a boat of his best oarsmen to make haste and row into the castle to be the first ones to inform the king about the incident. Despite the Russians’ long lead, the Swedish gig managed to catch up and pass the Russians and was first in to the castle to inform the king, who was said to be very pleased with his sailors’ rowing…. well, so the legend goes…. by God on a snack break. Rowing as a sport started at Eton College – though not all of its practices, such as those shown here on the 4th June Celebrations, were universally adopted. On my way to the 2013 ‘Henley Boat Races’ at Eton College’s Dorney Lake (which was also the site of the 2012 Olympic Regatta) I crossed the footbridge over the river from Windsor into Eton and was saddened to see that some of the boathouses on the site known as ‘Rafts’ have been demolished with the intention of replacing them with luxury apartments. This is especially significant as it was from this site that rowing at Eton College started and this is important as it is generally accepted that the school itself was the birthplace of rowing as an amateur sport. Rafts in June 2011. The boathouses from left to right are River House, Winters (both c. 1890), Tin Shed (the red brick building, c. 1947) and Pilkington’s (c. 1900). Rafts in March 2013. River House remains but Winters, Tin Shed and Pilkington’s are gone. You may be surprised to discover that the origin of the sport of rowing can be pinpointed to a single location in the English countryside. Rowing, not as a regulated guild profession of the British working class but as an organized recreational activity of the privileged British upper class, uniquely began during the last half of the 18th Century at a single site, Eton College, an English (fee paying) school. Mallory points out that, without any support from the school authorities 250 years ago, the boys were taking to boats during the spring and summer months, renting boats from the waterman establishments along the Windsor and Eton shorelines. The most important of these ‘waterman establishments’ were at ‘Rafts’, a 200-metre site between Windsor Bridge and Brocas Meadow on the Eton side of the river. Rafts like so many Eton institutions was for many years free enterprise. The six separate sections were at various times run by different local boatmen ... Not until 1909 did the whole length come under the ownership of the Eton College Boathouse. Searle’s were at Eton between 1850 and 1870. © Royal Windsor Website (RWWS). By 1895 Searle’s had become Halliday’s. A picture of Halliday's in 1898. © Royal Windsor Website (RWWS). 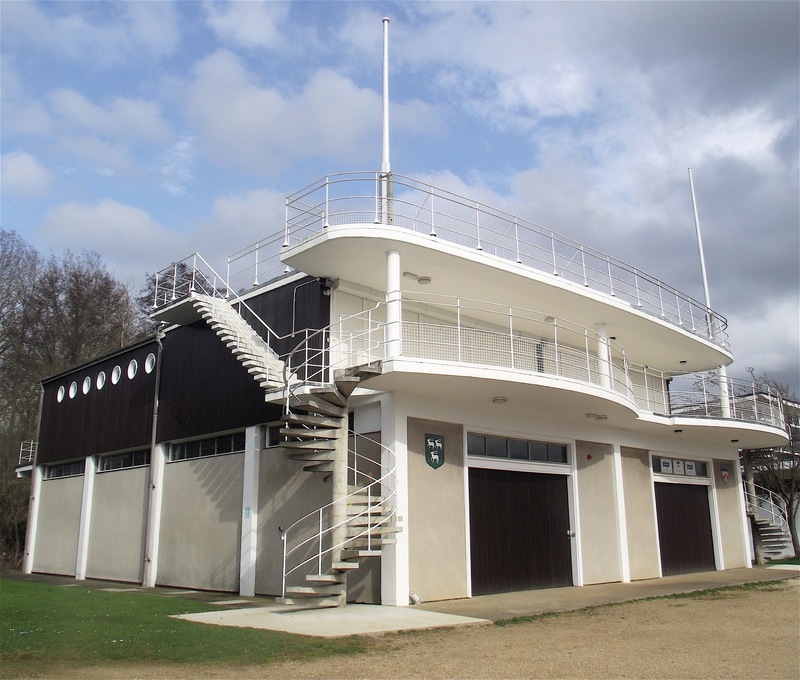 It is undeniable that, following the construction of its world-class rowing facility at Dorney Lake, Eton will have much less use for the boathouses at Rafts which, in any case, have long been ‘unfit for purpose’ and used mostly for rowing ‘below team level’. They are not particularly old or attractive buildings – especially the ugly late 1940s red brick building strangely known as ‘Tin Shed’. Perhaps worse damage was done in the 1970s when an attractive building between the current development and Windsor Bridge was demolished and replaced by the existing soulless structure. Also near the bridge is the former Eton College Boathouse, now in residential use. A fine early 18th century red brick construction, it survives not least because it has a ‘Grade II’ Preservation Order. Eton College and the site developers, Bewley Homes, have produced a very complex, elaborate and (naturally) self-justifying website showing their plans to provide 13 new residential units, boat shed space..... and public realm enhancements including providing public access to the river front...’. The website includes a very full ‘Heritage Statement’. This may be a legal requirement but I think that its depth shows that Eton is taking its responsibilities as a custodian of a great historical legacy seriously. The Statement is a large document but HTBS readers may find Appendix 6 (a history of the boathouses) and Appendix 7 (Eton’s future use of non Dorney boathouses) the most interesting. 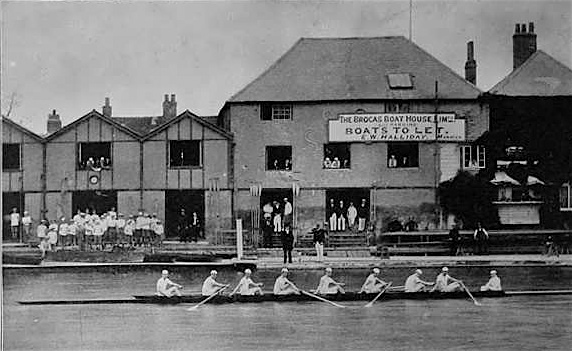 The (boathouses) broadly illustrate local social and economic trends associated with rowing, both commercial and in relation to the college, at Eton in the 19th and 20th centuries. They are not of national historic interest and do not have an exclusive historic link with the college....... They are essentially sheds for storage and manufacture that were converted and altered at different times .... 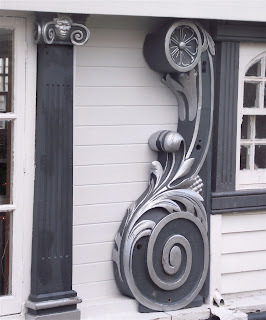 Very little remains internally today, particularly in the earlier buildings, to illustrate these uses.... the buildings stand today as an unremarkable group of disparate structures built by a variety of owners for a variety of specific uses. As this drawing shows, the sites of the previous four boathouses will still be distinctive and Pilkington’s will be redeveloped to include a boathouse for use by the School, at least in the near future. 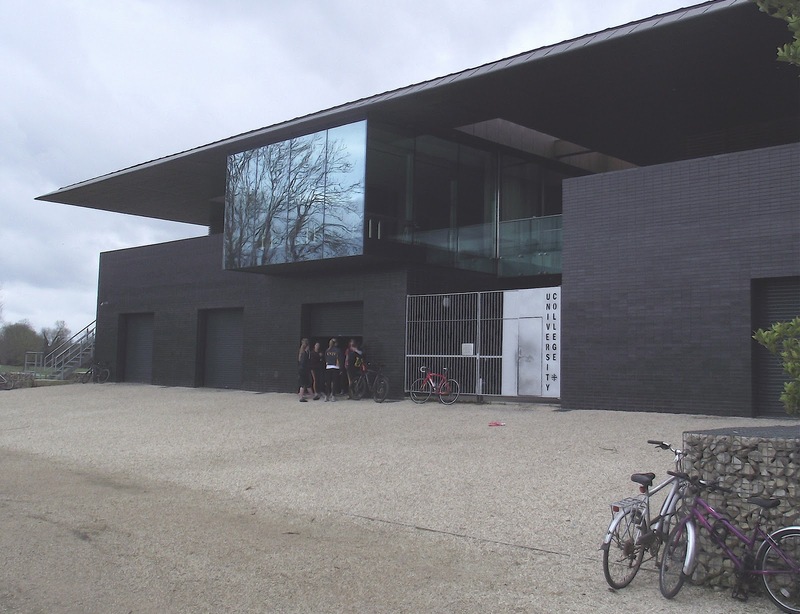 Fours, including the special coxed fours used in Eton’s version of ‘bump racing’ will be racked here (though the new storage will not be able to take eights). The rear of Pilkington’s in Brocas Street in June 2011. The site of Pilkington's in April 2013. River House can be seen over the fencing. There is no competitive rowing program at any level on earth with such a cornucopia of facilities..... with such historic ritual.... with such a long tradition of excellence. The school motto - Floreat Etona (May Eton flourish). Sadly, the 20th century incarnation of Rafts is an unavoidable casualty of the ongoing development of rowing at Eton. Hopefully its twenty first century embodiment will continue to play some role in the evolution of the sport at this unique institution. Dorney Lake - also known as The Eton College Rowing Centre. How many schools can boast such a world-class facility. *Subfusc: Formal academic dress worn by Eton College teaching staff such as the headmaster is wearing here. Oxford’s women celebrate their victories after their races on Dorney Lake earlier this spring. As has been announced earlier on HTBS and other media, in 2015 the women’s Boat Races will be held on the Thames on the same day as the men’s races. The women’s crews will also be properly sponsored. We often see or hear what the rowers and their clubs think about being sponsored, but the other day, HTBS’s Greg Denieffe found an interesting article in the Daily Telegraph written by Helena Morrissey, who is the CEO of Newton Investment Management and Founder of the 30pc Club, which is the company sponsoring the Oxford and Cambridge female rowers. As you can read above, not only did Pocock have a way of building boats, he also had a way with words. In the 1970s, a rowing movie was made which borrowed its title from Pocock’s ‘symphony of motion’. In this film we meet George Pocock, and also his son, Stan, and other legends in American rowing, Bill Tytus, Harry Parker, Ted Nash, Hart Perry and others. Special thanks to Mrs. B. who found this film in cyberspace! And draw a compliment from J. B. ** on his charger. ‘Nestor-Jones’ (*) was of course Henry Trevor-Jones, described by Seaman in a footnote as the ‘popular and perpetual coach of Trinity Hall’. In a second footnote Seaman wrote that ‘J.B.’ (**) was ‘J. B. Close, President of the C.U.B.C., 1894-5’ which demands an explanation. James B. Close rowed in three winning Cambridge crews in 1872, 1873 and 1874. The latter year, he was president of Cambridge University BC. For the 1895 Light Blue crew, Close was elected president again because he lived in Cambridge, but he did not row that year. With a non-rowing president, the cox Francis Begg undertook the captaincy of the crew. James B. Close’s one-year-older brother, John B. Close, also rowed for Cambridge, earning his Blue in 1871 and 1872. A third brother, William B. Close, earned his Blue in 1875, 1876 and 1877. In a second edition of Horace at Cambridge, which was published in 1902, the stanza in which Trevor-Jones and Close was mentioned was removed. 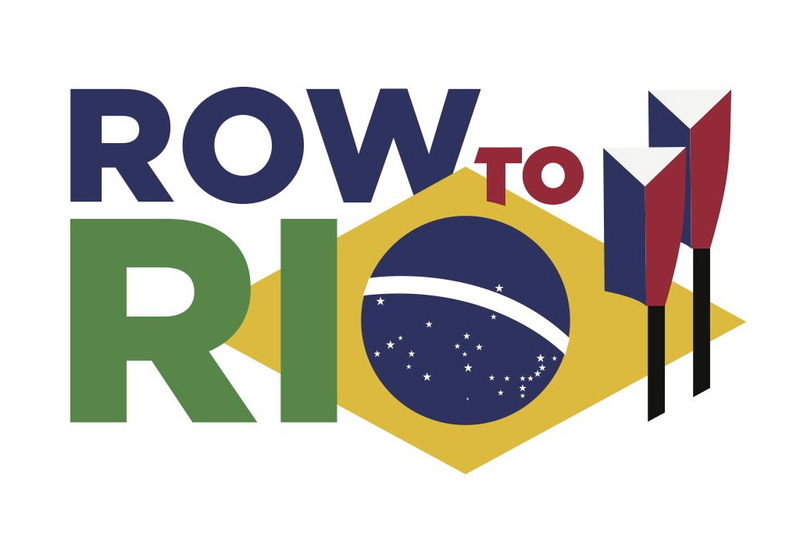 The other day, USRowing announced that Jake Mercuri is the winner of the Row to Rio logo contest. Mercuri’s logo was selected from over 120 entries through online voting and final selection committee nominations. 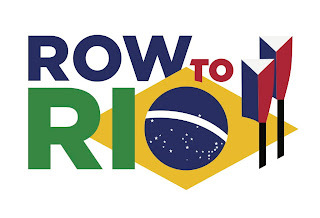 Chief Marketing Officer of USRowing, Beth Kohl, says in a press release ‘In choosing Jake Mercuri’s design, the committee loved the strong commitment to Rio depicted through the choice of the Brazilian colors and the flag, while incorporating the USA oars.’ The logo will be included in all aspects of USRowing and the National Rowing Foundation’s Row to Rio campaign, which Kohl said is designed to energize the rowing community to support the team training for Rio. Read an interview with Mercuri on USRowing’s website here. 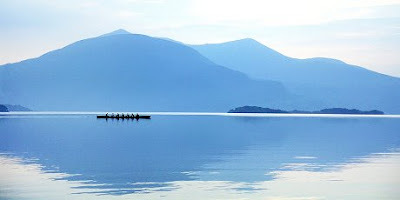 Tuesday’s post by Tim Koch, mentions ‘The Watermen’s Challenge’ which made me think about this year’s Killarney Rowing Festival, which is to be held on Sunday 28 July. This year’s Rowing Festival will also include crews from Oxford and Cambridge. 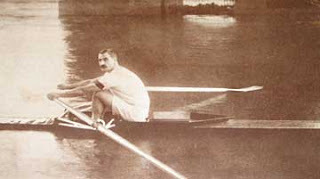 The style of rowing seen at the regatta is the traditional fixed-seat rowing in wide, wooden six-oared and four-oared boats. The invitation goes out to Irish university rowing clubs, whose members have no experience with this type of rowing, and the ‘Oxbridge Cutters’ should beware of the local clubs in Killarney. Killarney Regatta has a very good website and Valerie O’Sullivan, Killarney Regatta PRO who is also a photographer, has a portfolio of wonderful non-rowing pictures which you can access here or by following the links tab. 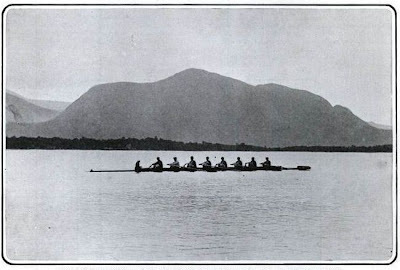 HTBS has previously covered rowing on the Lakes of Killarney when we wrote about Penn’s Visit To Ireland In July 1901. This year they will be asking ‘Which Blue Are You?’ in a Kerry accent of course! The 1901 Penn crew on one of the Lakes of Killarney. The 2013 OUBC Love Story ~ Love It! The (real) Cambridge Boat of 2013. In the 2013 University Boat Race, Oxford rowed in a German ‘Empacher’ while Cambridge used a Canadian ‘Hudson’. ‘Hear The Boat Sing’ has previously noted that once the boats for the ‘Battle of the Blues’ were not only made in Britain, they were produced from wood just a few feet from the Boat Race course. 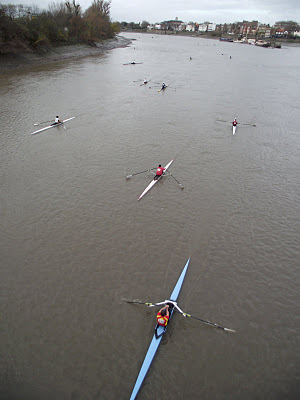 However, one hour before the start of the 159th Oxford - Cambridge clash, there was a race from Hammersmith to Putney (‘The Watermen’s Challenge’) which involved traditional British made craft. It included replicas of the two boats used in the first Oxford - Cambridge race in 1829. The (replica) Cambridge Boat of 1829. The ‘Oxbridge Cutters’ (as the pair are known) were commissioned by The Boat Race Company Ltd to celebrate the 150th Boat Race in 2004. 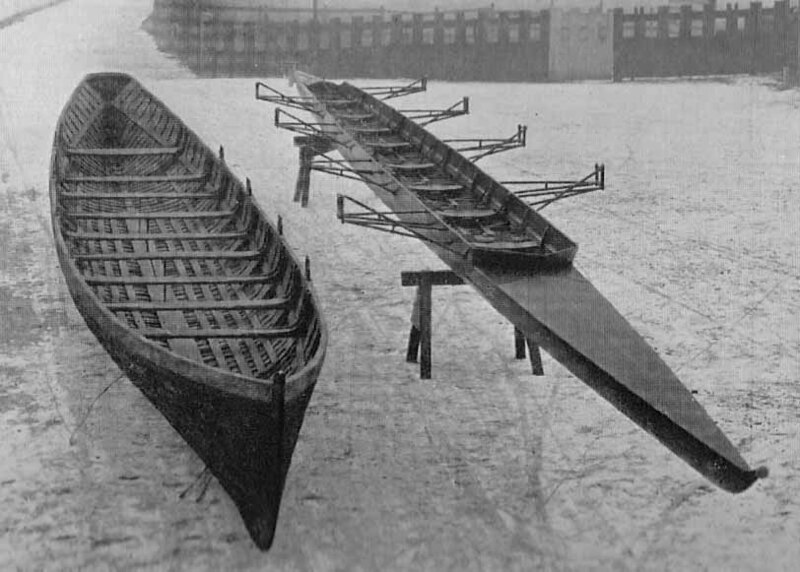 Like the original boats, the design was strongly influenced by Cornish Pilot Gigs, though the Oxbridge boats are made of pine, not elm, and are eight-oared, not six. Originally the replicas were painted in the original colours, green for Oxford and pink for Cambridge. Today, they have been repainted in the accepted dark blue and light blue. 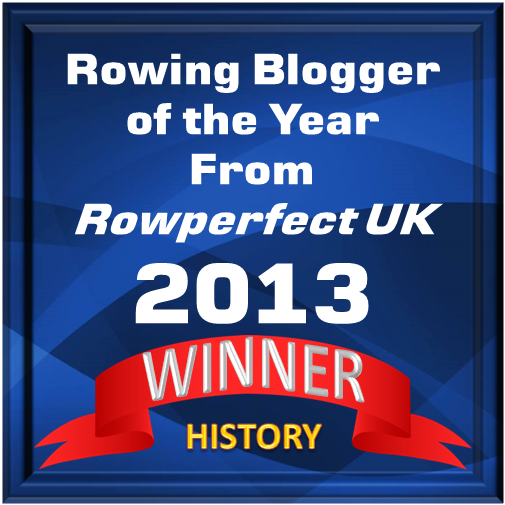 Last February they were given on long term loan to the charity, London Youth Rowing. It is good to know that the cutters will now be in regular use and will help to bring young people into the sport of rowing – truly ‘living history’. P.S. The original Oxford boat of 1829 is on now on display at the River and Rowing Museum in Henley. A famous picture of this boat and its 1929 successor is here. The replica Oxford Boat of 1829. As there are no outriggers and because the boat is wider in the middle than at the bow and stern, the oars are of different lengths to produce a uniform span. The sleeve is made of leather and the button is of rope. 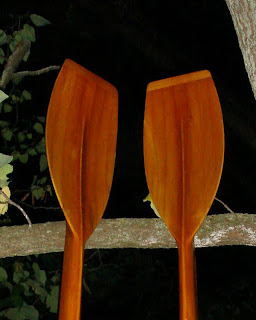 The oars are rowed ‘square blade’ and are not feathered. The seating is staggered, not in line, with starboard side rowers sitting on port and visa-versa.